One of the biggest construction works in Scandinavia is currently ongoing in the middle of Helsinki, the capital of Finland. The Finnish construction company YIT is building ‘the new heart of Helsinki’ in Pasila, an area called Tripla. Tripla is an impressive and challenging construction work with 183,000 square meters of floor space and three blocks, and, at its best, 1,300 construction workers on site. The Tripla area includes hotels, offices and residential buildings and a mall of 250 stores. The work also includes the demolition, reinforcement and rebuilding of the Pasila railway station, the second busiest railway station in Finland with over 1,000 trains and 60,000 passengers passing through on a daily basis. Most of the construction work above the railway needs to be done during the night when the train operations can be arranged. Hence the work needs to be designed, managed and prepared thoroughly during the day. I had the chance to visit the site in the beginning of July when the demolition work of the old railway station was on the rooftop level. One part of the work included securing 17-ton roof beams in place with the help of two Peikko’s COLIFT Mounting Systems. The COLIFT Mounting System, consisting of a mounting shaft, a slip guard and a spreader beam, enables safe and time-saving lifting and moving of columns and beams. With the remote release function, it saves time and manpower and eliminates the need to use a separate elevated platform for detaching the system from the elements. COLIFT was used in pairs while the beams were diamond cut loose from the surrounding concrete, then lifted and lowered down to be transported away. The calculation and designing of the cutting position and lifting operations were done by a structural designer. The preparation work with the hole cutting and marking the diamond cutting positions happened during the day to make sure all safety measures would be in place and all risks evaluated and tackled before the brief period of time available for this work during the night. Since then the demolition work has been proceeding fast and should be finished by the beginning of November 2017 and the new station to be built will be finished in 2019. The complete area is estimated to be finished in 2020. Tarja Jalli, BA.Sc. (Product Development), B.Sc. (Mechanical Construction), is responsible for Peikko’s Lifting Systems as a Product Manager. She started at Peikko in 2014. Earlier Tarja has held number of positions in Project Management, Product Development and Tool Design in mobile phone component industry (Eimo/Foxconn) and injection moulding tool manufacturing (Kopiotyöstö Oy). 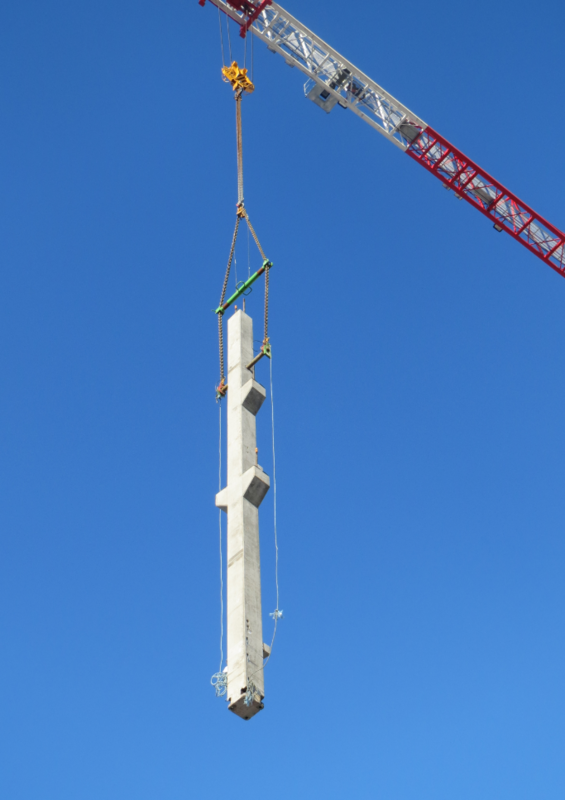 The COLIFT Mounting System is designed for easy and time-saving mounting of rod-shaped precast concrete elements, such as columns with varying lengths of corbels. The mounting shaft can be remotely released with a cord. Information exchange with multiple software - the future of structural design?